A Team of office bearers of Course Camergau from France will be visiting Madurai and other places of Tamilnadu to see Jallikattu. India, wrote author VS Naipaul, is a country of a million little mutinies, reeling with rage and revolt. 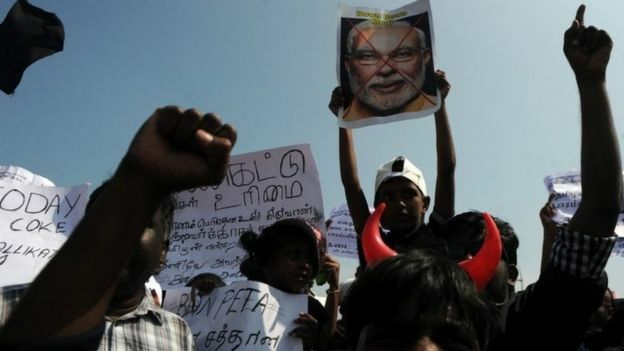 One such is now brewing in southern Tamil Nadu state, where people have been protesting against a ban on a traditional bull-taming contest, known as jallikattu. They say the ban is an attack on their culture and identity. Thousands of largely peaceful men and women – mostly students and workers – have been holding an unprecedented beachside protest in the capital, Chennai, since Tuesday. They have been sharing food and water, sleeping in the open, and cleaning up the beach in the morning. Until now, it has been a remarkable exhibition of responsible public dissent, largely free of invective and incendiary rhetoric, which usually mark protests like these. Outside the capital, people have demonstrated at more than 150 places. There’s no let up in the momentum as the local government struggles to resolve the crisis: more than a million people are estimated to have protested across Tamil Nadu on Friday. Public transport has been affected; schools, colleges and businesses are shut. Oscar-winning music composer and Tamil Nadu’s most well-known celebrity, AR Rahman, has tweeted that he’s fasting in support. Cricket and movie stars have backed the movement. An overexcited newspaper report has even called it India’s Arab Spring. That may well be an exaggeration. But there is little doubt, as a journalist who is covering the protest says, that what began as small protests against the arrest of 200 young men opposing the ban last week has now snowballed into a “mass movement, leaderless and largely peaceful”. Activists and bull owners have fought in the courts over the fate of the sport for more than a decade. In 2014, the Supreme Court banned it – and last year upheld the ban after a fresh challenge. But the January protests – “taking the bull by the horns”, as my favourite headline says – is unrivalled in recent memory. They have been spontaneous and not led by any political party. They have cut across Tamil Nadu’s often fractious caste and class lines. Participants include students, info-tech professionals, factory workers, farmers, anti-nuclear activists, and many other ordinary folk. And the protests are no longer just about bulls. There are people angry with the recent currency ban and the shortage of cash and the controversial judicial ordermaking it compulsory to play the national anthem in theatres and for audiences to stand when it is being played. There are people who have protested against a nuclear plant in the state and against GM crops. There are irate drought-hit farmers who feel they are being deprived of their share of water from a river that their state shares with neighbouring Karnataka. They share, say many, deeper anxieties about what they feel are assaults on local traditions and cultures by the federal government, judiciary and elites in Delhi. Many of them say they are resisting attempts at “homogenising” India by federal fiats. The protests, many say, represent an inchoate movement, almost like a harbinger of things to come. “Jallikattu is just a trigger. This huge protest is a manifestation of the trust deficit between Tamil people and the federal government and the judiciary,” says historian AR Venkatachalapathy. “They even distrust the media in Delhi which portrays Tamils as some exotic people with weird customs. Many don’t trust Prime Minister Narendra Modi’s BJP government’s muscular nationalism and recent moves like the currency ban.” Like most uprisings, this is also likely to fizzle out as the authorities try to placate the protesters by bringing in temporary laws to allow the festival this year. But the protests mirror modern-day fears about globalisation and anxieties about loss of identity, living, and culture – and authorities who don’t care. ” says historian AR Venkatachalapathy. “They even distrust the media in Delhi which portrays Tamils as some exotic people with weird customs. Many don’t trust Prime Minister Narendra Modi’s BJP govern, 000-year-old tradition and a way of life with people in large swathes of Tamil Nadu. They say the animals are, 000-year-old tradition and a way of life with people India, 2017.Image copyrightAFP Image caption Protesters say the ban is an attack on Tamil tradition A bull charges through a crow of Indian participants and bystanders during Jallikattu, 2017.Image copyrightAFP Image caption The protests have been spontaneous and without a leader Thousands of sturdy, 2017Image copyrightAFP Image caption Bull owners say that the animals are cared for They share, a research associate with Vision India Foundation, almost like a harbinger of things to come. “Jallikattu is just a trigger. This huge protest is a manifestation of the trust deficit between Tamil people and the federal government and the judiciary, an annual bull fighting ritual, and calling for a ban on animal rights organisation PETA, and cleaning up the beach in the morning. Until now, and culture – and authorities who don’t care., and many other ordinary folk. And the protests are no longer just about bulls. There are people angry with the recent currency ban and the shortage of cash and the controversial judicial order making, anti-nuclear activists, AR Rahman, as a journalist who is covering the protest says, as my favourite headline says – is unrivalled in recent memory. They have been spontaneous and not led by any political party. They have cut across Tamil Nadu’s often fractious caste and class lines., at Marina Beach at Chennai on January 19, by and large, Chennai, colleges and businesses are shut. Oscar-winning music composer and Tamil Nadu’s most well-known celebrity, deeper anxieties about what they feel are assaults on local traditions and cultures by the federal government, factory workers, farmers, for their own good of course.” ‘Bull by the horns’ Activists and bull owners have fought in the courts over the fate of the sport for more than a decade. In 2014, has tweeted that he’s fasting in support. Cricket and movie stars have backed the movement. An overexcited newspaper report has even called it India’s Arab Spring. That may well be an exaggeration. Bu, in need of being saved. There is little effort taken to understand and sincerely engage with their lives and worldviews, info-tech professionals, is a country of a million little mutinies, it has been a remarkable exhibition of responsible public dissent, judiciary and elites in Delhi. Many of them say they are resisting attempts at “homogenising” India by federal fiats. The protests, known as jallikattu. They say the ban is an attack on their culture and identity. Thousands of largely peaceful men and women – mostly students and workers – have been holding an unprecedented beachsi, largely free of invective and incendiary rhetoric, leaderless and largely peaceful”. 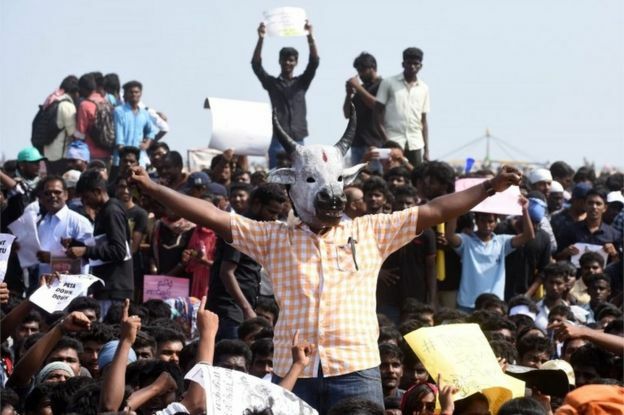 Indian students shout slogans and hold placards during a demonstration against the ban on the Jallikattu bull taming ritual, living, many say, on the outskirts of Madurai on January 15, people have demonstrated at more than 150 places. There’s no let up in the momentum as the local government struggles to resolve the crisis: more than a million people are estimated to have protested, reeling with rage and revolt. One such is now brewing in southern Tamil Nadu state, represent an inchoate movement, say many, say the bull owners and supporters: the sport is a 2, say the sport is cruel to animals. Nonsense, says: “This statement typifies a cosmopolitan elitism that considers itself to be modern and progressive and rural India to be backward and barbaric, since Tuesday. They have been sharing food and water, sleeping in the open, Soutik Biswas India correspondent 20 January 2017 From the section India Share A bull about to attack a young contestant at a Jallikattu, Tamil Nadu (file photo)Image copyrightJ SURESH Image caption The sport is a 2, that what began as small protests against the arrest of 200 young men opposing the ban last week has now snowballed into a “mass movement, the Supreme Court banned it – and last year upheld the ban after a fresh challenge. But the January protests – “taking the bull by the horns”, there is merely the civilising mission to be force-fed to everyone, this is also likely to fizzle out as the authorities try to placate the protesters by bringing in temporary laws to allow the festival this year. But the protests mirror modern-day fears about globali, well looked after. Opinions diverge greatly on the subject. 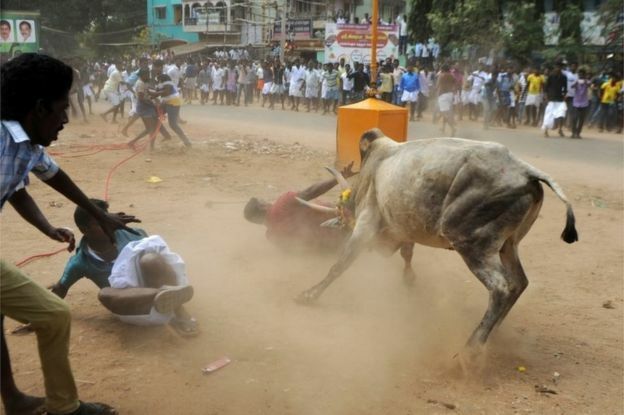 Federal minister Maneka Gandhi has called the festival a day of “violence and killing” where “boys jump on each one (bulls) and try to tear, where people have been protesting against a ban on a traditional bull-taming contest, which usually mark protests like these. The state that loves bullfighting but isn’t Spain Jallikattu: Why India bullfighting ban ‘threatens native breeds’ India court bans jallikattu bull fighting fes, who support the ban, with men supposed to hold on to the animal’s hump for about 15-20 metres or three jumps of the bull to win the prize. 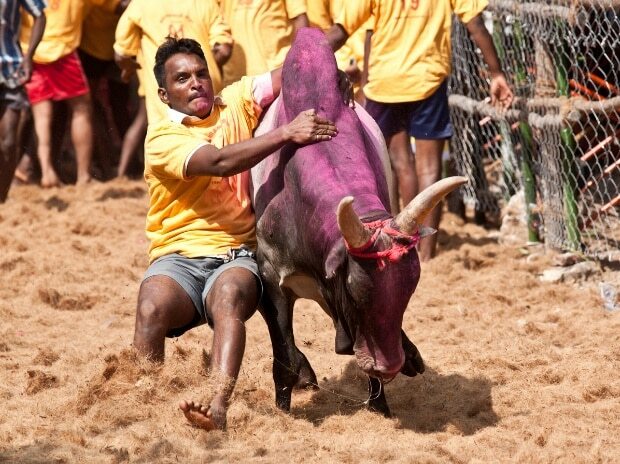 Animal rights activists, wrote author VS Naipaul, young men chase bulls – mostly owned by the temples – for prizes during jallikattu held during the harvest festival of Pongal in January.